1. So far in these commentaries on “post-ecopoetics” I have been focused on assessing how a number of recent potent poems draw from an environmental aesthetic in distress. There is no one way to envision or respond to the distresses of ecopoetics, and I do not mean to fixate on any declension narratives for culture (i.e. we lost our chance to realize the garden, so now we only get apocalypse). Poets and readers can respond to aesthetics in distress in multiple ways, using any range of approaches and attitudes. We don’t need to read the apocalyptic genre apocalyptically. Also, a sense of the origins and ends of our devices has always been present in our devices. 2. We have to deal with the planet we have now as it exists, this Eaarth, not just the planet we want or wish we could have had. All our tropes and forms are broken but still somewhat usable and viable, like the earth-systems they are coextensive with. All our aesthetics are exposed, as Stacy Alaimo discusses in Exposed: Environmental Politics and Pleasures in Posthuman Times (Duke University Press, 2016); yet amidst this exposure there can arise a revived environmental aesthetics that provokes “modes of posthumanist pleasure, environmental protest, and a sense of immersion within the strange agencies that constitute the world” (13). Instead of one avant-garde, we have many avant-gardes, differentially registering and creating with these partially-blasted figures and half-functioning devices. Instead of creative/uncreative binaries, we have post-creative cultures trying to make and do. As Stephanie LeMenager observes in a recent essay collection, “artistic genres are fraying, recombining, or otherwise moving outside our expectations of what they ought to be because life itself is moving outside our expectations for what it ought to be. It is worth considering how life itself begins to encourage new representational regimes” (477). 3. Post-ecopoetics is one of the frames by which we can assess being caught up in Trump’s authoritarian nationalist capitalism. But I don’t want to see any poetics reduced to a cause/effect situation. I see post-ecopoetics as indexing a global shuddering of ecopoetics as Trump doubles down on making a profit from the disaster-prone planet called Eaarth. Trump’s undermining of all the hard won social, environmental, educational, cultural institutions — which, of course, are substantial loci of jobs, so this was never about job creation as such — while putting earth in the hands of fossil fuel companies reeks of setting us all up for more disaster capitalism. 4. There doesn’t seem to be a widely circulated poem, style of writing, or formal device marking the Trump moment, yet (though Julie Carr’s recent post and commentary series address the many forms poets are using today in response). Maybe it’s too awkward a comparison, given how split and bitter Americans are today, but I’m thinking back to 9/11 when many people responded to violence and being attacked with a hunger for poetry and communication. I remember many circulations of poems, including prominently Auden’s “September 1, 1939,” with that haunting similarity of date and its mention of New York City’s perilous architecture being caught up in a “low dishonest decade.” As a kind of antidote, Auden wrote, “We must love one another or die,” but later cringed at the line. Yet both the admission and the wanting to revoke it seem apt. 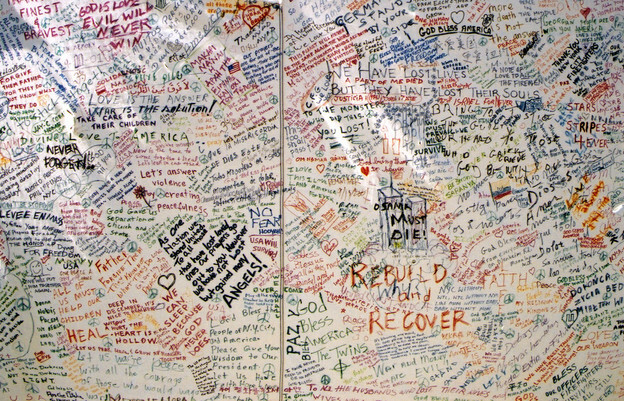 Two other moments of 9/11 writing stick with me. One is all the notes and scraps of writing left in the subways and elsewhere looking for friends and family — we also read those, because we needed to, as a kind of found poem. The other moment: as it happens, my younger brother, Jordan, was living in lower Manhattan then as a student at NYU. That evening, he unfurled a huge roll of industrial-size paper in Union Square Park that surrounded the entire block and left writing utensils for anyone to add what they needed to say (see picture above). The roll was left out for a week and became filled with all sorts of writings. At one point Bill Clinton came by and added to it. It seemed everyone needed to come together to write and read at the same moment. Looking back, that historical turning point did closely coincide with a formal turning point in poetics, caught especially by Kenneth Goldsmith’s Day, a prose poem made from retyping of all the language found in the New York Times edition of September 1, 2000. Reading Day became caught up in the reading the day of 9/11 (Goldsmith later copied the New York Times of that date as well). We find today, as Auden did, that just to show love is an antiauthoritarian and emancipatory political act. But so is the reminder that there need be no State — which was always all a great fiction, and doesn’t exist if you don’t want it. Ecopoetics, attuned to ecosystems, ecojustice, and planet, harbored all along some of that rejection of the State in its devices. Militarization and poem meet in the intertidal zone, in which pools memory, violence, care, colonization, and coastal cultures. Perez writes amidst all of this, for a past and future Guåhan. Reading this book in the midst of yet another military expansion phase, these poems make preparations for the next underwater volcano. I remember marigolds, zinnias, and asters. I remember marigolds there, zinnias, pansies early, hollyhocks. This is not what I remember marigolds looking like. Some summers now a lone poppy rises in the field. For some reason, I remember the marigolds. The stars at night, sleeping with the Indian moon, a white sheet on the window. A pastoral “I remember” poem, but the memory is conjured from a Google search for “I remember marigolds.” This is still a kind of cultivating of the garden, even if it never was anyone’s garden and only can be cultivated through the Internet. 7. The last aspect of “post-ecopoetics” I want to point to highlights issues of deep time embedded in our devices. Our poetic forms and signs we use might already be more legible to readers in ten thousand years than poems are to us from just a few hundred years ago. I don’t know what this means for the political present exactly, but as for the deep political future, poems ten thousand years from now will still be dealing with global environmental changes we’ve set in motion. Whoever the readers are in ten thousand years will be reading us intimately, with acutely shared affective and ecological frames. By comparison art from ten thousand years ago seems also more intimate and legible to us than art in closer time periods (such as much of the religious iconographic art from medieval times up to recent generations). Art occurring around the time of the last Ice Age, from cave paintings to symbolic representations carved in wood and bone, came about during massive environmental changes felt within the span of a few human generations. Also during this period there was a miniextinction event, due to human hunting and climate change. Such Ice Age art, mostly animal iconography with some geometric signs, is “about” the ambivalent desire to both widen and close the gap between humans and animals. The animality and environmentality of that art still resonates powerfully with us. I want to place in this context John Cage’s work ASLSP, As Slow As Possible (which, cutely, should be the acronym ASAP). The work, which debuted in 1985, calls for the playing of the notes as slow as possible, with an unspecified duration. A version of this work is currently being played by an automated organ at the St. Burchardi church in Halberstadt, Germany (thanks to my colleague Kate Stanley for pointing this out to me). The performance began in 2001 and is to last for 639 years (the church was 639 years old at the inauguration of the performance), ending in 2640. This long scale of art calls for other long and large scales of thought and art. This slow music is playing out at a time scale closer to the geological than the human. Perhaps the entire performance will last the next geological era of the Anthropocene. There is also the possibility that this work will outlast the church, the State, perhaps still playing in the ruins of some overwhelming event, or playing without any human listener to witness it. Will this music still be legible/hearable at the end of its performance as at the beginning? This piece exposes both the deep time aspects of our aesthetic devices but also includes a sense that there is a kind of ticking clock within all of our aesthetics. Hence the temporal anxiety implicitly posited in all art, which continually asks as it persists: how long can this artwork go on?